The sheer amount of stuff in our lives can be completely overwhelming. Simply cleaning and maintaining our homes is a job in and of itself. Worse still, once you get behind it seems impossible to catch up. If you’re wondering how to reduce clutter in your home, begin the journey with me here. De-cluttering is essential to creating a space that my family can thrive in. Removing clutter from our home has kept us organized and contributes to a more relaxing, stress-free environment. Over the years I’ve become an expert at creating this simplicity for my family and now I’m sharing my simplification secrets with you! If you make my easy recipes you know that I worship the art of simplicity. I have a passion for uncomplicated comfort. I’ve shared that passion with my boys and husband and now they’ve built this habit as well. That’s not to say that when the boys are home from college, running around town, catching up with friends that their rooms are clean. Often nowadays I walk in and there are clothes all over the place. But when they lived under my roof full-time we had rules! And of course consequences. The anecdote above is to let you know it’s not about perfection, it’s about function. So let’s get started! “Determine what’s essential” sounds fancy. Basically, this is what I call the “use it or lose it” rule. Your possessions don’t have to be exceptional to be worthy, they just have to be useful. It’s that simple. Forget about asking yourself “do I need this?” because we don’t need 90% of what we have. Instead, ask yourself, “do I use this?” If you don’t, it likely doesn’t belong in your home. I remember helping a friend a couple of decades ago. 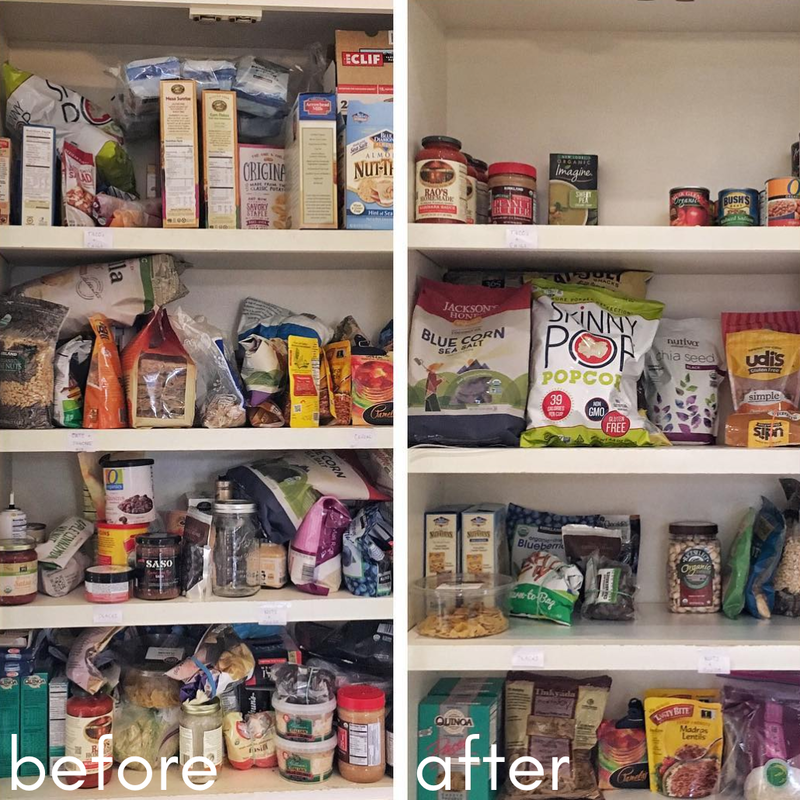 We cleaned out her New York City apartment after she went through a painful divorce. The process required a lot of time, and a lot of sorting and the emotional baggage that some of the items contained was intense. Your space holds stuff, that stuff holds memories, and those memories hold energy. It’s ok to give things away that you don’t resonate with positively. In fact, it’s ok to give away anything! A special family heirloom could be your treasure. It could also be a trigger, an anchor that activates memories you don’t want to hold onto and be reminded of (even unconsciously) every single time you look at it. Making space in your home will make space in your heart. And your brain too. Tackling types of stuff rather than rooms will conserve a lot of brain power. This is something I’ve done for as long as I can remember. I take on clothing, for example, so I can get a full inventory of what everyone needs, or rather no longer needs. Same for books. I like to look at all of the books we own in totality to get an idea of what we have and what needs to go. I’ve heard this is a Marie Kondo strategy so I must be doing it right! I like to work on the visible clutter that’s on surfaces before I do anything else. This keeps areas free to become important work spaces. It will also give you immediate results, or at least results after a couple of hours if your house is really full of stuff and in need of some de-cluttering love. We put away the “keep” and “relocate” items, and whatever we’re letting go of into a giveaway box or a trash bag for items we’re discarding. When I sort stuff with the boys in their rooms we also use a recycling bag for unwanted papers. Last summer, one of the boys wanted to go shopping for clothes with his friends. I told him I’d help him clean out his closet prior to the shopping trip. An hour later, he and his friend Jack came downstairs with arms full of clothing he had outgrown. Last year he grew 6 inches and is now well over 6 feet tall. We’ve been cleaning out the boys’ closets since they were very little and I’m grateful that this habit has become so contagious that the boys now do it themselves! 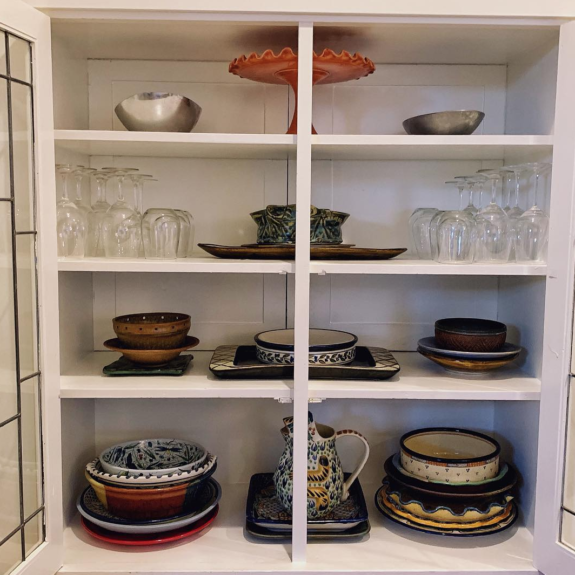 This is a photo of my favorite neighbor’s pottery cabinet. We did a big clean out of it on New Year’s Day, eliminating four bags of pottery and trays that she took to Goodwill later in the week. She was so much happier with the cabinet after this clean out and reorganization. Having all of these useful items that she loves, at hand and easily accessible, made her more relaxed and optimistic about entertaining. Now it’s full of her favorite beautiful and functional pieces. Cleaning out and editing made this collection feel so much more abundant. I have a designated area in our garage for items I’m giving away. First, I offer the neighbors clothing in good condition that the boys have outgrown. I don’t give our neighbors dirty, stained, or ripped clothing, which I use as rags or for patching other clothes. Sometimes these items get thrown away. Store your giveaway pile in the basement, or if you live in an apartment, in the bottom of a closet. All of the leftover items go to a local thrift store. I don’t accept free gifts and other things I won’t use and politely say “no thank you” when stores have promotions. When we’re sent samples or holiday gifts from companies they go in the giveaway pile. Unless it’s wine which is amazing and useful for entertaining. We also don’t go shopping as an activity, and we don’t shop to pass the time, so we don’t end up buying things that are useless. Another habit is that I keep a certain number of hangers in my closet so that when I buy a piece of clothing, I give away something else to keep inventory as low as possible. Using the buddy system is fantastic because de-cluttering can be emotional. You may want to hire a professional organizer if it’s in your budget. Or, like me, you may want to do these types of projects with a friend. When we were evacuated due to a forest fire in 2017, we stayed with friends. During that time, I helped them clean out their pantry. The buddy system is great for a few reasons. First, cleaning, sorting, and organizing your belongings can be stressful, so having a friend hold your hand is wonderful. Second, it makes the entire process fun and time flies by. Finally, you can also bounce ideas off your friend and they can hold you accountable, asking if you really need to keep something or give you permission to let it go. If you’re a regular reader here, you’ve experienced the theme of healthy simplicity that is woven into my recipes and my life. Now, let me know how you feel about de-cluttering. What are your biggest challenges? What are your favorite strategies for simplifying your stuff? You have impacted families, provided education beyond the knowledge of many MD’s and led those with chronic health issues to find healing through nutrition and self-care. Oh, dear Elana – what a beautiful post and including “triggers” is what really stopped me in my tracks. Your books (recipes) have helped for years as all four of my children are on the Autism Spectrum (Asperger’s, or Aspies). Their diagnosis meant that Mum & Dad finally had answers to many of their own quirks! This post is what I needed, and quite frankly didn’t expect to find from you. Life has been overwhelming with cancer (me) and overwhelming behavioural issues with the teens. We have just moved, and the boxes are sky high. There have been mild purges in our 16 years of marriage, but not many. Or not deep enough. A lot was purged before our recent move. Much more faces me in the moving boxes that abound. However your tips and straightforward approach are helpful. I’m not one to leave comments, but want you to know that what you have done with your life is so much more than author books or blog. You have impacted families, provided education beyond the knowledge of many MD’s and led those with chronic health issues to find healing through nutrition and self care. May you enjoy peace and blessings for your selflessness.